The key objective of Russia’s Union of Oil & Gas Producers is to form corporate solidarity: to identify common positions, to unite the whole Russian oil and gas community under mutually beneficial terms and interests. 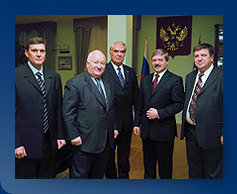 To solve urgent problems of vital activities of the fuel & energy industry, to establish lasting law and order and dictate of the law as well as stability required for progress in the country’s economy by all legal and available means and methods, including appeals to the President, Government and to the Federation Council. To protect rights and interests of the Union’s members when forming legislation that is necessary to conduct operations in the fuel & energy industry. 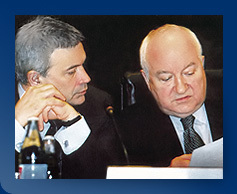 The strategic task of the Union in terms of legislation has always been to support elaboration and adoption of federal laws such as “On resources”, “On pipeline transportation”, “Gas Code”, “Petroleum Code” or the single “Energy Code”, which shall include all necessary legal aspects of activities of oil & gas companies and strategic interests of the state. To be involved in drawing up and implementing national programs to secure energy safety for Russia and to encourage oil and gas industries. To work out and implement, together with companies in the oil & gas industry, oil & gas building enterprises, banks and insurance companies, a common policy in order to involve investments into the oil & gas sector, ensuring progressive development of the fuel industry and energy safety for Russia. Intense business contacts with international oil institutions: OPEC, Petroleum Advisory Forum that represents the international oil community in Moscow, OECD, US Agency for International Development, other foreign partners – Association of Petroleum Engineers of Mexico, Association of Oil & Gas Producers of Germany and French Institute for Oil & Gas, - aimed at implementing investment projects, exchanging market experiences and training personnel. 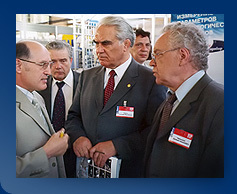 Organizational participation in promoting and popularizing up-to-date high technologies for oil, gas and refining industries – in the form of international sectoral exhibitions, congresses and seminars, scientific conferences which usually draw up corporate recommendations and suggestions for the Government and Federation Council of the RF. To initiate improvement of mechanisms of economic management, coordination and control system in the sector, intensification of public relations with the RF Government, to make it customary to hold consultations with public corporate organizations when making important strategic decisions. To back small-size businesses in the oil & gas industry.